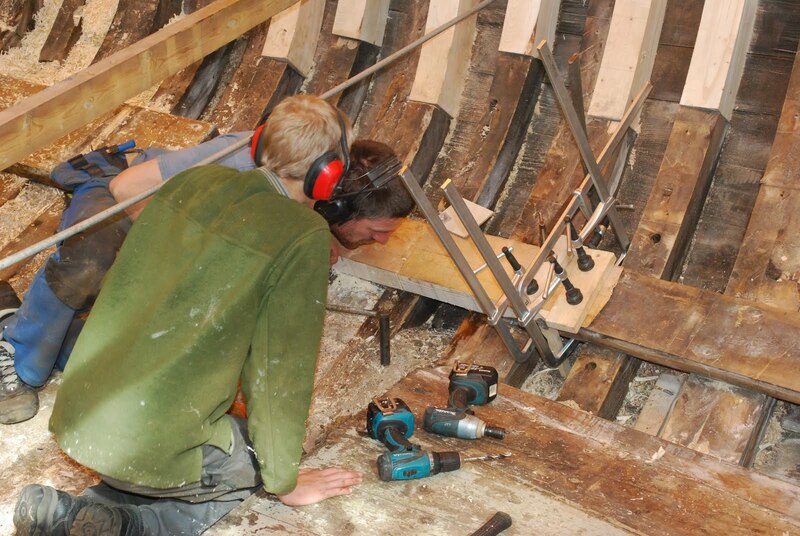 Martin repaired the two ends of the “livholt” and now Joost is helping to see if they can get one of the rotten pegs out, next week they have to see if they can find the peg on the outside because from here it isn’t working. Click here if you want to read the Introduction/first post. it seems to stand still. On the port side Joost is busy changing more planks. 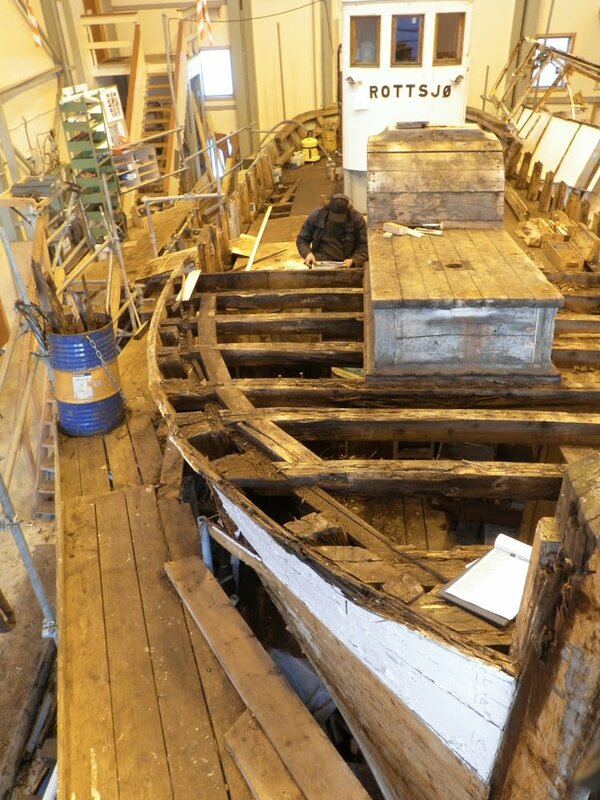 We are still changing less planks than anticipated and it looks like it will stay that way. Life, thinly spread out in the valleys of white mountains and dark soil. The loneliness here is in its nature close when the silence takes you. And the cold coming from the mountains gives you a harsh calm. This week Peder, the electrician finished his work on Brottsjø for this year. All the old switches, sockets and switchboards are cleaned, measured and repaired, if necessary using old parts where possible. 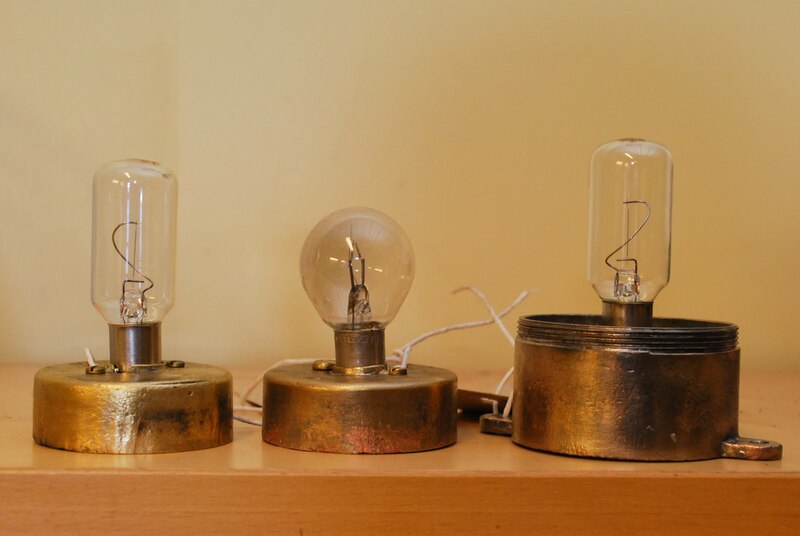 Look at the results, they look like new again. This week I worked with the new stern. The old stern didn’t fit so good anymore after so many years so I spent some time measuring the old Skin and inner stern/knee to make sure that the new one fits good. 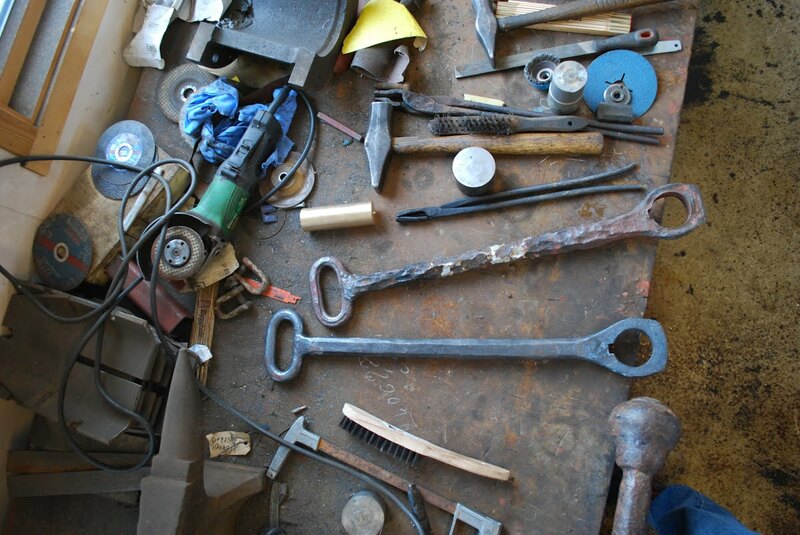 Our smith has made a new part for the steering system. Chains from the steering wheel control this arm that is connected to the rudder, it was originally made by a smith so we used the same techniques to copy the old one. This week we started making the first new parts for Brottsjø and the sun is also back, what more do you want. 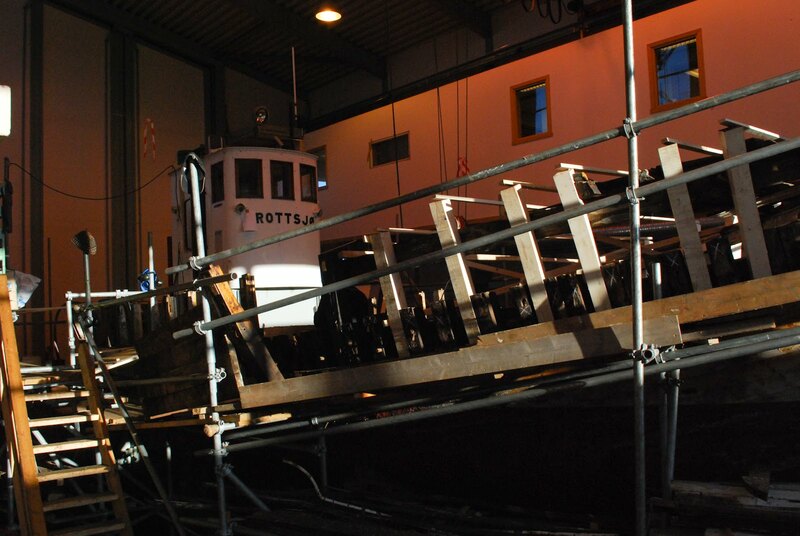 We started working again on Brottsjø this week. 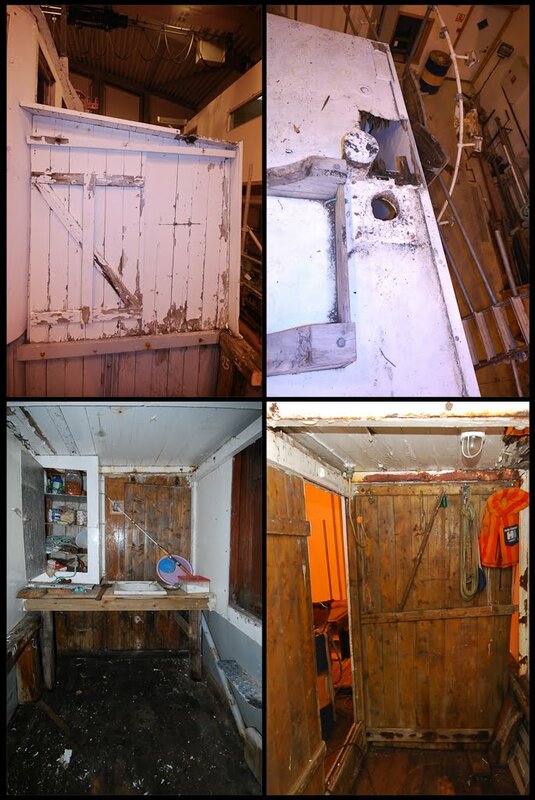 Because we don’t have enough boat builders work goes slowly on board Brottsjø but, we started working with the electric systems and Kazimierz the mechanic is organizing and planning his work. This week we removed the “egnerhus”. There are parts from different periods, from the 1960 to the ’90. Under the glass fiber roof cover, probably from the 70’s we found small nails indicating that there was originally a canvas cover on the wooden roof. The sink and poorly made table are from the 90’s and have to go. When Brottsjø was used for fishing there was also a second stove standing in the “egnerhus” used for cooking and drying cloth, you can still see the round hole. 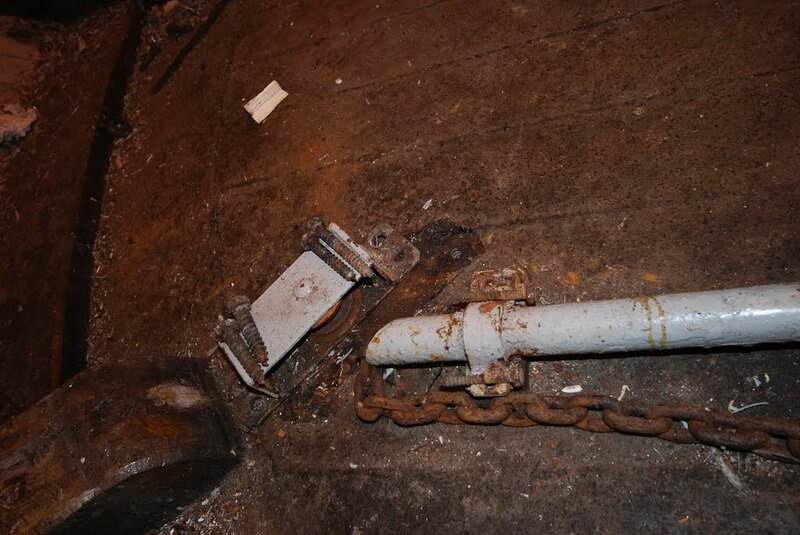 One of the last things the mechanics took of Brottsjø were the tubes around the chain steering. Now they can begin with restoring and cleaning everything. 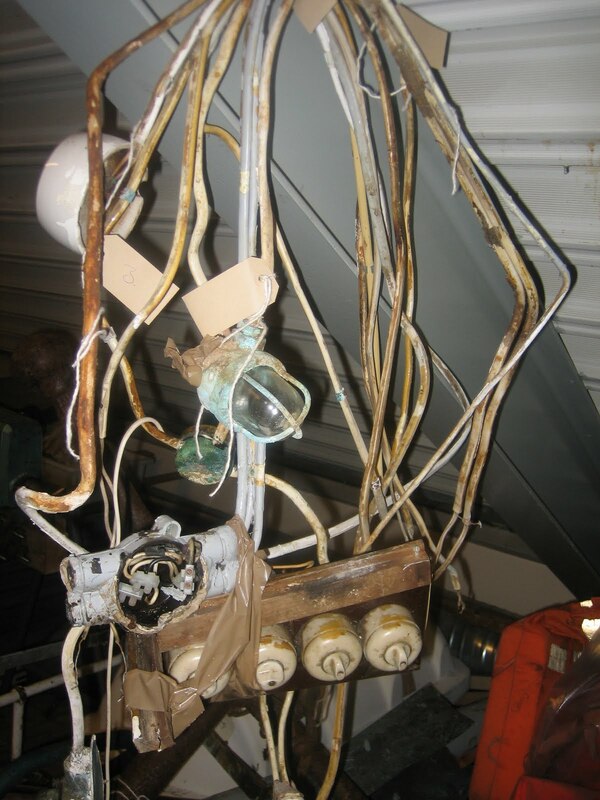 One of the problems with the old electricity, the wiring, switches, sockets and equipment is that we don’t exactly know what we can use later. What are the regulations, is it aloud to use old wires. The goal is to save as much of the original as is allowed so for now it’s finding out the regulations. 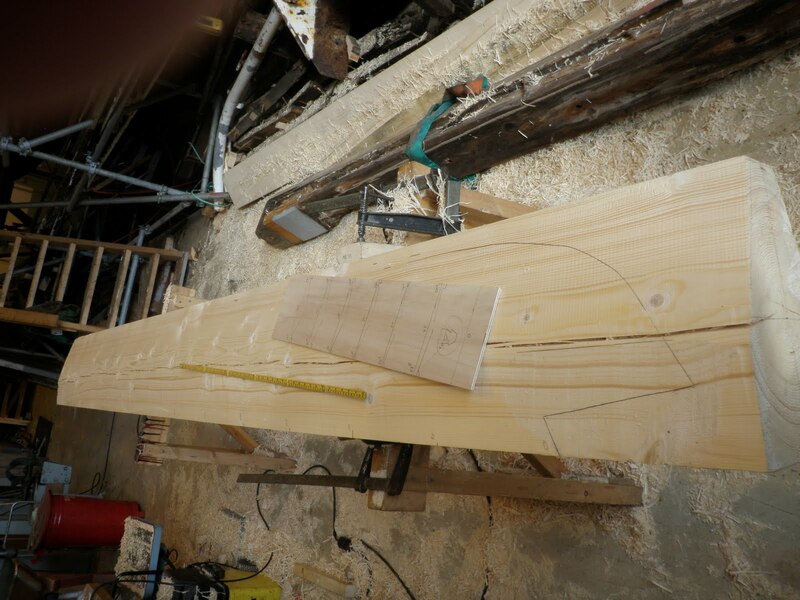 Almost 10 Years ago I worked for the Nordnorsk Fartøyvernsenter og Båtmuseum in Gratangen Norway as a wooden boat builder. There are three of these “fartøyvernsenter”, (boat preservation center) in Norway, two are specialized in restoring wooden boats and one is specialized in steel or iron boats. 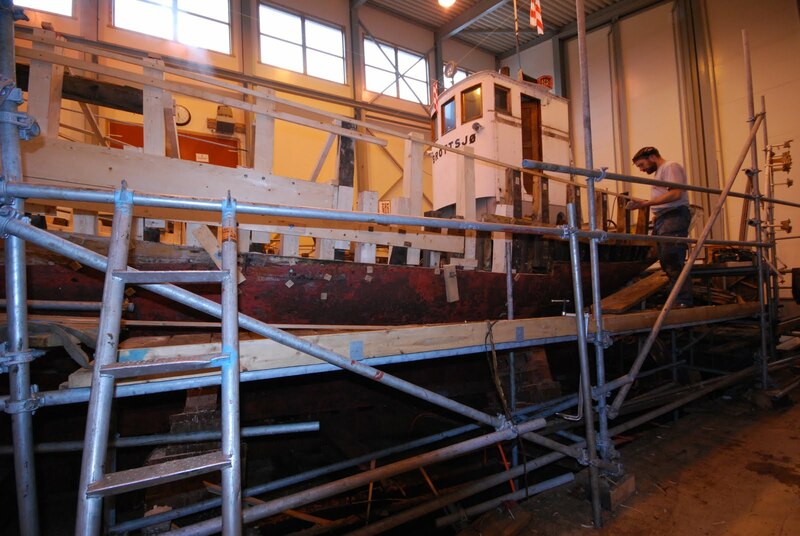 I started working in Gratangen in 2006 as a boat builder and in 2010 I was responsible as project manager for the Restoration of Brottsjø together with the help of the other experienced boat builders. Because my Norwegian writing skills were not good enough I started a blog where I wrote in English and kept a relative detailed rapport on what I was doing on a weekly basis. In our family it was tradition to make a photo album after a vacation. I really like these albums and when I’m home I often like to look in these old albums. I personally still try to do this, but I have to admit that I leg a view vacations behind. For most people these days the vacation pictures are taken with a digital camera and stored on a computer or still on there phones. Had a nice walk in our backyard today.